Special clothing range for babies and toddlers! - Stylish range of jackets, pants and tops, with a difference. - Clothes that grow with your baby! 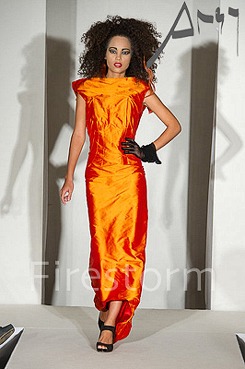 Angy Morton is an avant-garde designer with many years experience working in the fashion industry. Her business is centred on unique outfits, one-off designs and customised versions of the stylish clothes in her collections - see her online 'BUTiQ' for further details: http://angymorton.co.uk/ Here, you will find 'in house' designed ready to wear, made to measure and off-the-peg collections, in addition to eye-catching haute couture confections that would grace any red carpet. Angy's speciality is creating something unique and 'different' and she is always challenging that fine line between the 'urban chic' and 'sheer fantasy'. She prides herself on her commitment to provide a professional and unique service at all times, whilst maintaining the highest quality of work. She can also design and make a handbag, a purse, a hat or a fascinator from the same fabric as your outfit, individually crafted to suit your style. We also specialize in recycled handbags as well as more conventional travel handbags or daytime and evening purses. Angy can create for you, that special, individial garment you have always dreamed of, something unique, eye-catching and a statement of who you are which cannot fail to impress! "Keep it simple" is her favourite motto, but "add as much detail, personality and flair as you can." She adds: "Creativity is an integral part of us as individuals. Without creativity we wouldn't be where we are today as a society. The tricky part is how we can express that creativity in fashion, architecture, jewellery and so on. From my experience, it can only be achieved with considerable patience and skill." Everybody likes to appear elegant, to be in vogue and to wear an outfit with a simple line that enhances their appearance. It is not an easy task. That is why the skills and experience of the professional designer are vital. Even when they are performing the impossible, and are wizards with the fabrics, an outfit cannot speak for itself' without your own, individual input. That is why Angy usually requests a consultation session to find about more about you. Individual input also includes choosing the right hairstyle and the right accessories to add the icing to cake. Angy's style is all embracing; influenced by anything that comes her way. Whether it is the natural landscape of her home in the English Lake District, the lines of a building, the delicate shades of a wildflower, or even the pattern of veins in a leaf, her inspiration is sure to transcribe such hints of everyday beauty into each individual design and outfit she crafts. It is very difficult to select just one out of the many artistic styles, which have shaped our society, from mediaeval times to the present. Each of them has something fresh to offer providing you know what you are looking for. Angy's personal favourite? "Art Nouveau. Beautiful and Feminine. The details are amazing. Some people will dismiss these designs straight away because they are asymmetrical rather than geometric and logical, and may appear complex or fussy. However, as you look closer you realise that art nouveau designs comprise sensitive, soft and sinuous lines, which make up naturally, organic and floral patterns. In my opinion these are just the right 'lines' for a unique and outstanding outfit." I followed the basic bugs with a series of other simple but eye-catching designs, some of them with a 'sixtiess' feel to them. Check my BUTiQ for details or browse through some of the stunning images from my photo shoot with Mike Kells (link below). I can also take orders for limited lines for select boutiques. 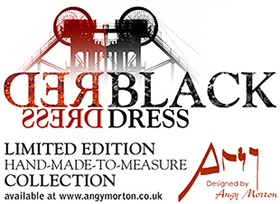 Angy's REDDRESSBLACKDRESS is a collection of classic, stylish red and black dresses. These 'hand-made-to-measure' designs will be exhibited for the first time at her 'Catwalk on Water' fashion show during Whitehaven Festival. They will be accompanied by her latest couture creations: recycled dresses inspired by the red and black of West Cumbria's heritage, iron and coal, among them her spectacular Montreal No.4 and Wellington 1910 designs. PYROMANIA is a mix of limited edition 'hand made' lines, which can be made to measure on order, and are available from online BUTiQ. Angy also has plans to develop variations on some of these designs which can be manufactured in the United Kingdom as limited edition 'prêt-à-porter' lines. 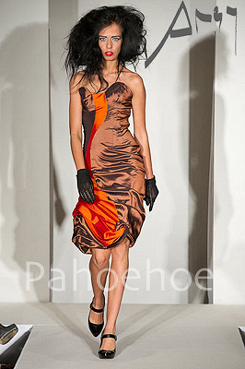 yromania was exhibited on the catwalk at London Fashion Week (see below). Pyromania comprises two themes based around the elegant, sinuous curve of 'Midnight Sun', and the stylish, angular, low cut back of 'Wildfire'. Angy may not be granted permission to literally set the runway on fire, but hopefully these new outfits will ignite a spark of pleasure! 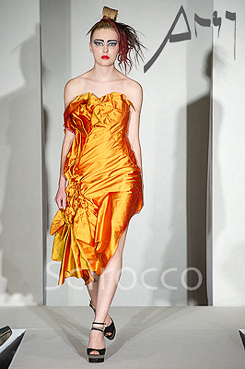 The outfits are available in dazzling fiery reds, oranges and yellows, or in monochromatic themes. They all bear names reflecting the Pyromania theme, from which Angy has drawn her inspiration - from the explosive 'Krakatau' to the serene 'Fuji', the elegant curves of 'Pacaya' and foaming streams of 'Kilhauea' to the twisted geology of 'Pahoehoe', and the energy of 'Astraphobia'. The sports-luxe look may be all the rage on the catwalk right now, but few designers are prepared to make sport and fashion such close bedfellows as Angy Morton, whose latest range of couture gowns is made from Premier League football shirts. The unmistakeable logos, colours and fabrics have been twisted and stitched into classic evening gown shapes, affixed with lace and adorned with chiffon, making them a lot less practical and probably a lot pricier than the original garments. Russell Brand's American pop-singer girlfriend Katy Perry titillated MTV viewers when she supported her man's West Ham allegiance by wearing a saucier version of the maroon and blue strip while presenting the European Music Awards last November. "Since Perry wore that West Ham strip I reckon a lot of men have been wishing their girlfriends would dress like that," remarked The Independent's sports correspondent Simon Rice. If he's right then it won't be long before Morton's Stolen Dreams' collection of 19 couture dresses representing 16 UK football teams is snapped up and strutted in by the WAGs. A fashion designer who is defying a red card ban from some of the countrys top soccer clubs will be unveiling her football inspired collection in the North East next week. 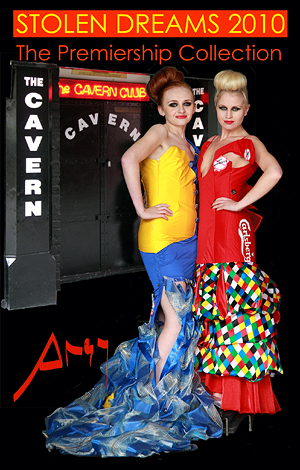 Avante garde designer Angy Morton has created a whole range of fantasy evening wear using the soccer strips of some of the UKs top teams. And while some have given her the go-ahead to show her collection, others have forbidden her to use their branding and logo. But Angy, from Cumbria, is determined to show her Stolen Dreams dresses as planned and will unveil them at a catwalk event being held at Newcastles Eldon Gardens on Thursday (November 12). Stolen Dreams is a unique fusion of fashion and football which has been inspired by the ups and downs of top flight football, she said. North East teams such as Sunderland and Newcastle have given Angy their blessing as have leading sportswear manufacturers Umbro but shes had a resounding no from Chelsea and Liverpool who have said she cant use their logo or trademark  despite the fact that the dresses are not for sale. But Angy has come up with a unique way to beat the ban  and now intends to make some minor alterations to ensure these one-off pieces can take to the catwalk. Stolen Dreams has lead to an ongoing project to create designer or unique fan wear. Samples, especially jackets, have been designed for clubs that have shown an interest, and some were even exhibited on a catwalk at London Fashion Week. In addition to providing fan wear for dpecific football clubs, Angy is also looking at other sports including rugby. Angy will take orders for one-off creations such as wedding dresses or jackets, but fans must bear in mind that she will only be able to proceed with the club in question, and some are much more co-operative than others!